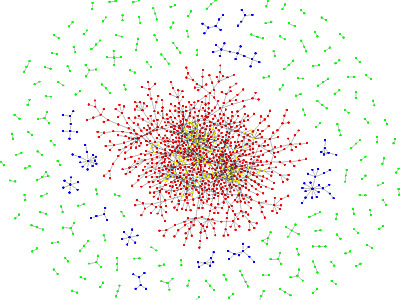 This is a map of an online community, which portraits a concentric structure where the network "hubs" or "connectors" -- people with a high number of ties, are located in the center. This arrangement cleverly follows the inherent organization of these type of communities, where the hubs are the central elements of its sustainability. As the author explains: "Parts of it are well connected, while most of it is sparse. We see this pattern with many emergent communities -- groups that people join and participate in through common interests or affiliations. Two nodes are connected if they have exchanged emails or IMs past a certain level. The nodes are colored by their connectivity. 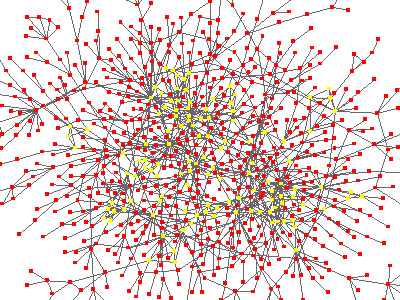 The yellow nodes are the core, with the greatest number of direct links. The red nodes are connected to the core and have less interconnectivity. The blue nodes are "young clusters" that are just forming. The green nodes are various forms of isolates who may have just joined the on-line community, or have chosen to be inactive -- they may be the common "lurker" found in many on-line communities. The lurker listens to the public info being disseminated but chooses not to interact."